King Hagan, also known as the Wise Old King, is King Skarl's older (and wiser!) brother who rules over the kingdom of Brightvale. Both Hagan and his kingdom are known for wisdom and intelligence. If you impress him with some wisdom of your own, you can be greatly rewarded. The Wise Old King is "Out to Study" from 8 AM to 9 AM, 1 PM to 2 PM, and then once more from 7 PM to 8 PM. The Wise Old King is unavailable at those times and you won't be able to tell him any of your wonderful wisdom. You get a LOT of choices when you make a phrase to try and impress the oh-so-wise one, shown below. When you hit submit, you will get your score out of 1000. If he liked what you said, he will give you an A+, a B, or an F, but sometimes he will all ready know what you told him and you merely get a few (20-50) neopoints given to you for trying. 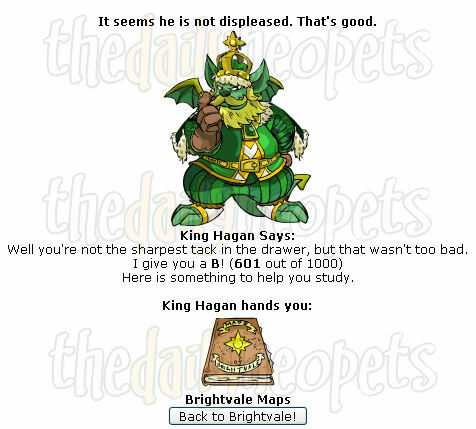 For an A, you get a few hundred neopints as well as an item, a B will get you will get a random (and cheap) book about Brightvale or King Hagan, and an F will just get you yelled at. Your grade is totally random. You could say something that makes no sense in any way and get an A+, or say something that's actually very wise and get an F.